High blood pressure is also referred as hypertension. In a study, it is found that every 4th person in the world is experiencing hypertension. Blood pressure is a force of blood against arteries. In high blood pressure, Heart gets tighten and works harder that make arteries tighten. A normal blood pressure rate is 120/80. High blood pressure rate is 140.90. Check your blood pressure and if it is found below 120/80, then it is ok. But if it is found between 120/80 and 140/90 then you are experiencing prehypertension High blood pressure increase the chance of heart-related diseases. It can develop stroke. It is very dangerous because there is no indication or symptom of hypertension. 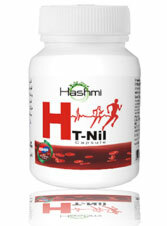 HT Nil is the best herbal treatment capsule to fight against hypertension or high blood pressure. It is purely made from various kinds of herbs and no chemicals or preservative added during the creation of this product. During the formation of this capsule herbs are selected very carefully that can regulate the flow of blood in your body. You will get rid of high blood pressure with this capsule. HT Nil targets blood vessels that now become constricted inside your body. This capsule improves the heart’s potential to pump blood effectively. It also helps in fighting against the plaque created in the arteries of our body. This capsule is the best stress reducer and also develops good resistance in our body to fight against infections and other illness. You can see the effect of this capsule by regularly using it for 3 to 4 weeks. Blood spots in the eyes. For each and every person, there might not be a single cause resulting in hypertension. It can be a genetic factor. There are various families where members are experiencing hypertension. Smoking and alcohol consumption are also an important factor that are responsible for high blood pressure. People who intake high salt in their daily diet are often experiencing high blood pressure. Salt contains sodium that can increase blood pressure. Improper diet, poor daily schedule can also give rise to hypertension. People who don’t do exercise also suffer from high blood pressure problem. If you will not burn the necessary fat then it will affect you after some years. Do herbal supplements really help? Yes, herbal supplements really help in fighting against hypertension. By maintaining a good diet and using herbal products, we can lower our blood pressure or can maintain steady and normal blood pressure. The herbal system not only maintains the blood level, they also improve our digestive system. All the diseases a person face in his/her life is related to stomach. Herbs have natural properties that can improve our heart functioning, arteries and cardiovascular system. Herbal treatment can be very effective if you follow a good diet chart with regular exercise. We, at Hashmi Unani Pharmacy Company which was founded by Hakeem Hashmi in 1929 in order to provide people with high quality herbal products is one amongst leading companies in India offering herbal products.